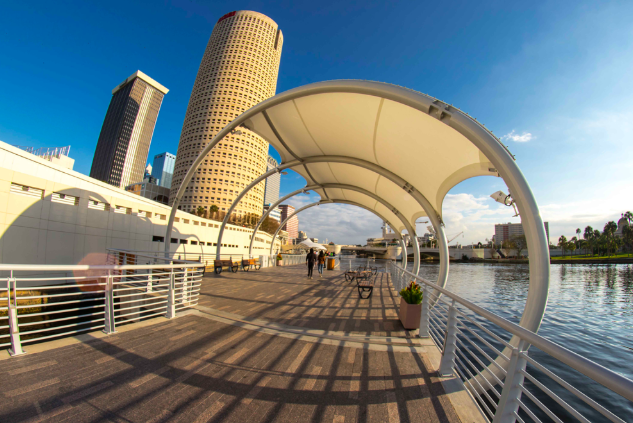 Tampa Riverwalk Named People's Choice for Great Place America! Click here to learn more about the Riverwalk and its contributions to place making within the city! 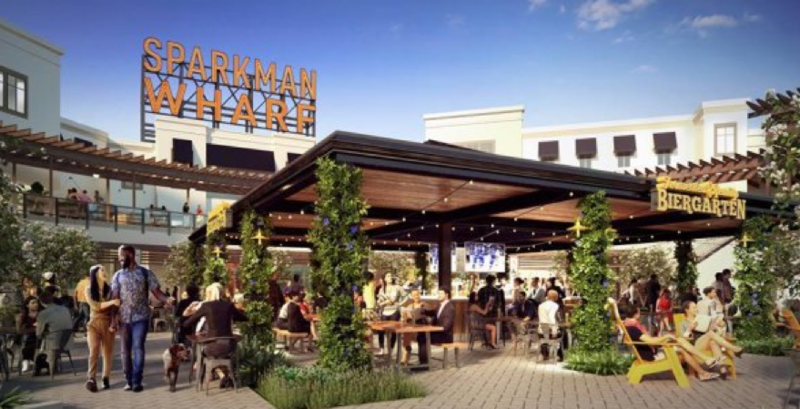 Join us 5:30 p.m. on Friday, Dec. 7 for a holiday happy hour at the soon-to-open Sparkman Wharf in Channelside. We'll meet at the Fermented Reality Biergarten and can branch out to explore all the food and drink options this new spot has to offer. 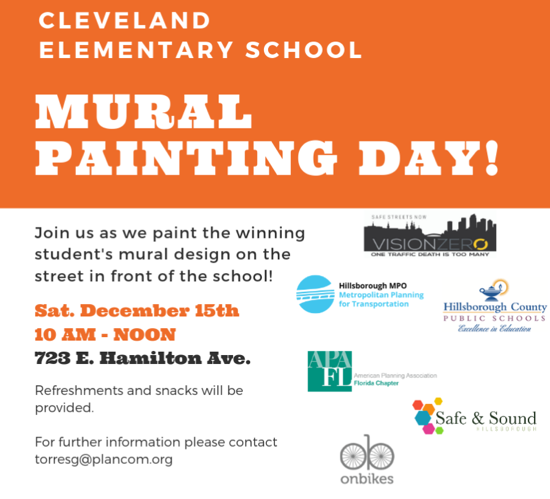 Join the Sun Coast Section, Hillsborough MPO and Cleveland Elementary as they paint a street mural as part of the Vision Zero Hillsborough campaign to eliminate severe crashes. Volunteers will meet from 10 am to noon on Dec. 15 at 723 E. Hamilton Ave. in Tampa to add the student-designed artwork to a nearby street. The mural will help alert drivers to the presence of pedestrians and encourage them to slow down. Sun Coast APA is a sponsor of the event, and section members are encouraged to volunteer. For more information, contact Hillsborough MPO Executive Planner Gena Torres at torresg@plancom.org. Welcome to the Sun Coast Section! 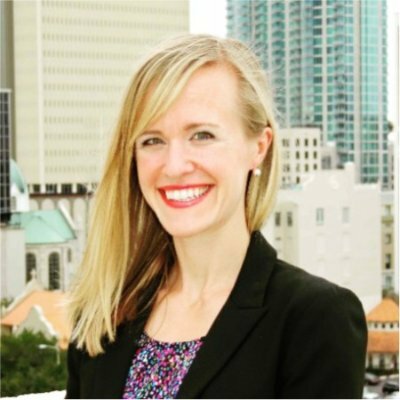 We are a division of the Florida Chapter of the American Planning Association (APA FL) spanning the Gulf Coast counties of Citrus, Hernando, Hillsborough, Manatee, Pasco, Pinellas, and Sarasota. Our goal is to provide our diverse membership with an equally diverse range of professional development, networking and other opportunities. If you are interested in joining APA, please visit the national APA website, www.planning.org. Your 2018-2019 Sun Coast Section Executive Committee members are here to serve you and we are looking forward to another great year. We have a fantastic group of Area Directors and a YPG Representative who will be reaching out in the coming weeks about event ideas in your area, and the Executive Committee will be holding a retreat in late October to plan out a roadmap for the coming year. The Section’s mentoring initiatives, for both students and mid-level professionals, will be a continued focus. Additionally, the Women in Planning group will continue to expand with additional programming. We will also be offering a variety of fun educational and social opportunities – some targeted to new planners, some to experienced professionals, but hopefully all will benefit you no matter where you are in your career. You can also connect with us on Facebook to stay even more connected! To view upcoming events in our section, you can view our calendar here. Did you know that you can receive our Section newsletter, Horizons Newsletter, as well as other email updates even if you’re not a member? Contact the Sun Coast Section Communications Officer at suncoastcomm@gmail.com to add your contact to our distribution list. One of my goals as Chair is to make sure the Section provides a great value for your membership. Please feel free to contact me at any time with your ideas, suggestions or feedback at suncoastfapa@gmail.com or dickensm@plancom.org.